I went on an Amazon shopping spree recently that included the decorating book, The Nest. The book contains endless inspiration, including the above photo. We had started looking around for a candle display for master bath jacuzzi tub, but in the back of my head I knew we could get a bit more creative. Also, try as I might, I'm still not a huge candle person. I'm coming around, but am always afraid the house is going to burn down. 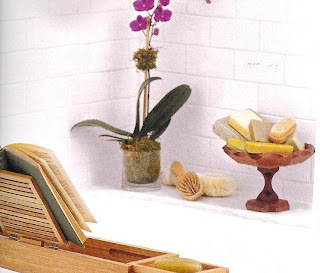 So, when I saw this stand filled with luxurious soaps and bath accessories, I thought, "I could make that!" First step was googling "soap stand" but I didn't get too far with that one. Then I realized it sort of resembled a cake stand and I could just buy one of those. With prices of $30 and up on cake stands, my next thought was "maybe I could make a cake stand. . ." A couple searches later and I had my answer. Props to this blog for giving me the best how-to tutorial. Inspired by the IKEA Hacker blog, I started with the short Skimmer candlestick (this candlestick) and a Smarta pie plate similar to this (can't find the exact one online). I wanted to paint the stand purple to match our master bath decor, so rather than buy a whole container, I took red paint and blue paint I already had and mixed them together. A couple coats later, it was starting to come together. . . I bought Gorilla Glue at Blick (a day later seeing it for a dollar cheaper at Home Depot - d'oh!) and applied a thin layer on the top of the candlestick. Adhere to the instructions when it says "thin layer" - it expands while drying and could easily get out of control. I centered the candlestick on the pie plate by using a ruler to measure radius all the way around and weighted it down with a couple books. The Gorilla Glue said wait one hour for it to dry, but I left it overnight to be on the safe side. After painting the glue that expanded past the candlestick with some of my leftover purple it was all set for the bathroom. World Market was having a bath and body sale so I stocked up on lavender, lilac, honey and vanilla soaps. Adding pretty jars of bath salts and bubble bath along with a couple loofah accessories rounded out the display. Added benefit: the bathroom smells great thanks to the open soaps! Good Job! I like it. Hey I was wondering what type of paint did you use? Hi Fareeha - I just used acrylic paint from the craft store because that is what I had available, but it takes a few coats. Spray paint would probably be easier! Hi Lydia, Did the acrylic paint hold up well in the bathroom? Just wondering if it started to flake because of the steam. it has held up very well, actually the only reason it isn't intact anymore is because I repainted it dark blue to use as our cake stand at our wedding! I think it could be worth a coat of sealer if you wanted to be sure though.